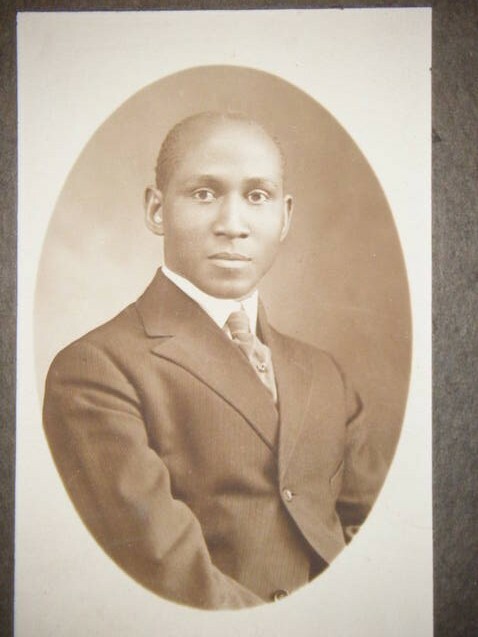 This recent find is courtesy of FamilySearch.org. 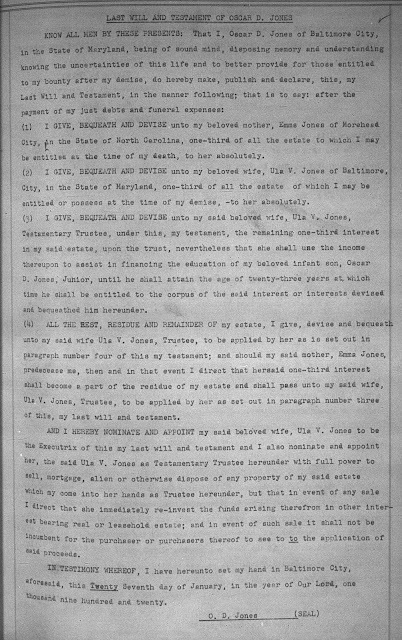 The probate record is a bit long so I have decided to break it up and feature it over the next couple of Amanuensis Mondays. (1) I GIVE, BEQUEATH AND DEVISE unto my beloved mother, Emms Jones of Morehead City, in the State of North Carolina, one-third of all the estate to which I may be entitled at the time of my death, to her absolutely. 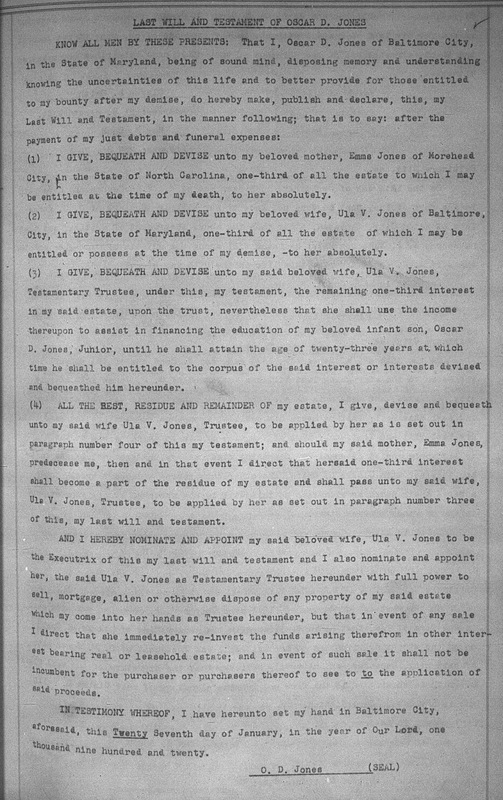 (2) I GIVE, BEQUEATH AND DEVISE unto my beloved wife, Ula V. Jones of Baltimore, City, in the State of Maryland, one-third of all the estate of which I maybe entitled or possess at the time of my demise, - to her absolutely. 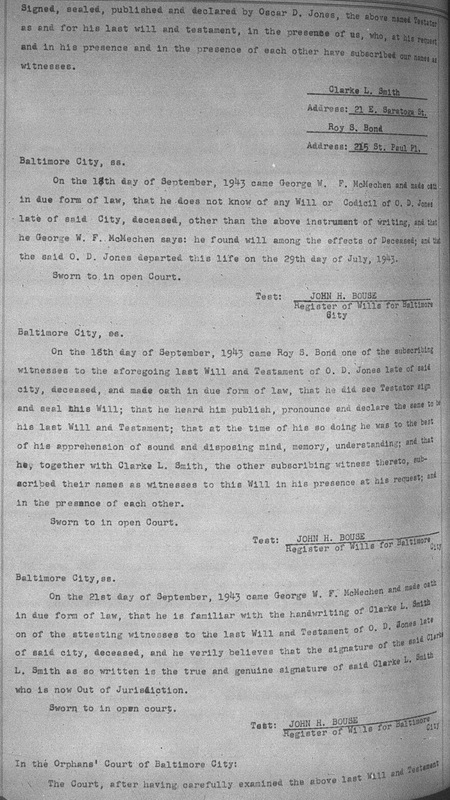 (3) I GIVE, BEQUEATH AND DEVISE unto my said beloved wife, Ula V. Jones, Testamentary Trustee, under this, my testament, the remaining one-third interest in my said estate, upon the trust, nevertheless that she shall use the income thereupon to assist in financing the education of my beloved infant son, Oscar D. Jones Jr. until he shall attain the age of twenty-three years at which time he shall be entitled to the corpus of the said interest or interests devised and bequeathed him hereunder. (4) ALL THE REST, RESIDUE AND REMAINDER OF my estate, I give, devise and bequeath unto my said wife Ula V. Jones, Trustee, to be applied by her as is set out in paragraph number four of this testament; and should my said mother, Emma Jones, predecease me, then and in that event I direct that heresaid one-third interest shall become a part of the residue of my estate and shall pass unto my said wife, Ula V. Jones, Trustee, to be applied by her as set out in paragraph number three of this, my last will and testament. AND I HEREBY NOMINATE AND APPOINT my said beloved wife, Ula V. Jones to be the Executrix of this my last will and testament and I also nominate and appoint her, the said Ula V. Jones as Testamentary Trustee hereunder with full power to sell, mortgage, alien or otherwise dispose of any property of my said estate which my come into her hands as Trustee hereunder, but that in event of any sale I direct that she immediately re-invest the funds arising therefrom in other interest bearing real or leasehold estate; and in event of such sale it shall not be incumbent for the purchaser or purchasers thereof to see to to the application of said proceeds. IN TESTIMONY WHEREOF, I have hereunto set my hand in Baltimore City, aforesaid, this Twenty Seventh day of January, in the year of Our Lord, one thousand nine hundred and twenty. Signed, sealed, published and declared by Oscar D. Jones, the above named Testator as and for his last will and testament, in the presence of us, who, at his request and in his presence and in the presence of each other have subscribed our names as witnesses. Address: 21 E. Saratoga St. Address: 215 St. Paul Pl. This seems to me to be a good stopping point. I will pick up with the another portion of this record next Monday. This will seems very clear -- he is bequeathing his estate in equal measure to his wife, mother, and son. And his wife is the Executrix. I'll look forward to the next parts.